A couple of years ago I read (and very much enjoyed) Valeria Luiselli’s novel Faces in the Crowd, and now we have Sidewalks, a collection of essays from this talented young Mexican writer. Luiselli, a keen observer, is a little like a modern-day flâneur (or in one essay, a ‘cycleur’, a flâneur on a bicycle), and we follow her through the city streets and sidewalks, seeing the surroundings through her eyes and gaining access to her thoughts. There are those who say that Mexico City is like a Big Pear – a bizarre sister of the Big Apple; the widest part of the fruit to the south and the stalk somewhere around the Basílica de Guadalupe, in the northernmost borough. But on more careful examination, the flesh of the fruit has, in fact, overflowed far beyond its skin. A contemporary artist – or a child – might represent the pear-city with a silhouette, like the ones drawn in chalk at the scene of a murder, the consequences of which exceed the supposed contaminant of the outline: pear splattered on tarmac. I loved this collection of Valeria Luiselli’s illuminating essays, many of which have a philosophical and melancholy tone. The writing is excellent. Luiselli’s words (and Christina MacSweeney’s translation) seem to flow effortlessly across the page, and one could describe these glimpses into the author’s world as graceful prose poems or laments. In some respects, Sidewalks reminds me a little of Renata Adler’s Speedboat (which I’ll be reviewing in a few weeks’ time); while Speedboat is a novel, the two books share certain similarities in style and tone. Sidewalks also brings to mind Teju Cole’s Open City, a comparison Tony Malone makes in his excellent review of Luiselli’s novel, Faces in the Crowd. My one regret is that Sidewalks isn’t longer – Luiselli’s writing runs to around 100 pages – but let’s hope there’s more on the way. I read this book to link in with Biblibio’s #WITMonth (focusing on Women in Translation), which is running throughout August, and also Richard and Stu’s Spanish Lit Month which has been extended by a week or two. 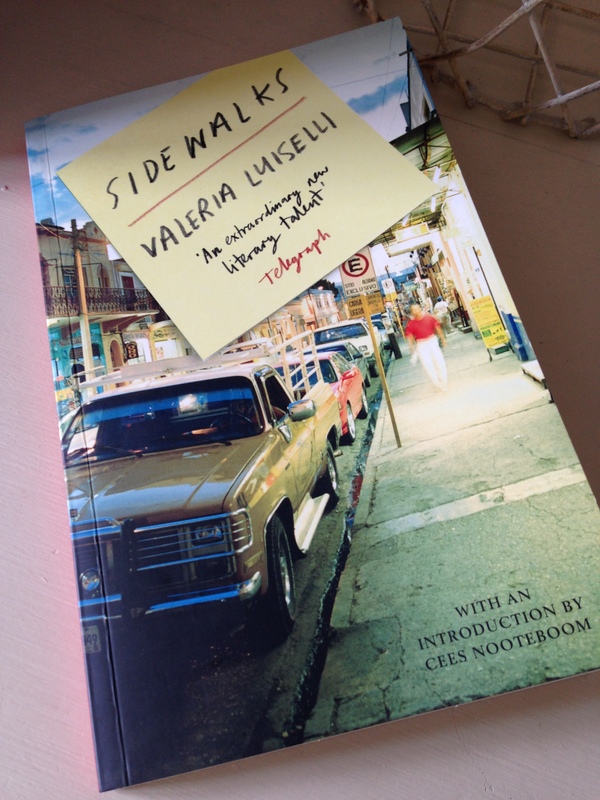 Sidewalks is published in the UK by Granta Books. Source: personal copy. This entry was posted in Book Reviews, Luiselli Valeria, Women in Translation and tagged #ReadWomen2014, #SpanishLitMonth, #TranslationThurs, #WITMonth, Christina MacSweeney, Granta Books, Literature in Translation, Mexico, Non-fiction, Valeria Luiselli, Women in Translation on August 4, 2014 by JacquiWine.